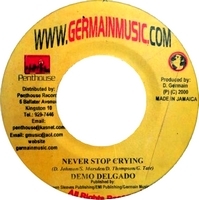 Demo Delgado is a young and talented dancehall artist who recorded some singles for Penthouse label at the start of the 2000s. Return on the beginning of his promising career and his collaboration with Donovan Germain. First can you tell more about you. Where do you come from ? I've started music at a tender age, I am 26 now so I've been in the music over 11 years. I grew up in Seaview Gardens and that's where I started sharpening my musical talent, I first started recording for one of the member of The Mighty Diamonds, that's when I took it serious and wanted it as a career. While living in Seaview I met up with Wayne Smith who at the time had a studio right beside a Bounty Killer yard, the Inncocent Crew alongside myself use to sharpen our skills in Sleng Teng studio. People like Bounty Killer, Shabba Ranks, Super Cat everybody comes through Sleng Teng studio, so that's where I am from. How did you start music ? While attending High School, one of my friend at the time introduced me to Sandy Thompson and Mark who's Dad is a member of the group Black Uhuru. They had a company - Vertical Production - which consisted of Spragga Benz, Nico Flexx, Greg Hinds, Tanya Stephens up in Mona Heights. That's where I became professional at it. I was 15 years old. We went to Freddie McGregor studio and record my first song "For No Reason". This was about in 1994-95, the first time my song ever get played on the radio. Your artist name "Demo" is the shortening of the word demolition. Why did you choose this name ? Yes, the name ''Demo'' derives from the word "demolition". It's linked to lyrical clashes in School, just like Bounty and Beenie Man thing. Were you influenced by other artists ? I think you sing a little like Terror Fabulous. 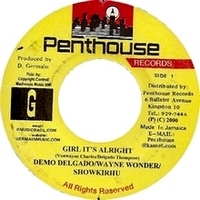 At the beginning of the 2000s, you recorded songs for Donovan Germain's Penthouse label. How did you get connected ? Wayne Wonder brought me to Germain to voice a collaboration song. He got that riddim from Lenky Marsden. Lenky wanted Wayne and I to do a collaboration on the "Lenky's Bomb" riddim so we wrote the lyrics of together and a part for Showki. After our second song for Penthouse, “Girl It’s Alright”, Germain gave me some more riddims to work with so I guess he was pleased with what we did. You also recorded other songs with Wayne Wonder on his own label Singso (like "Metal and Steel" on Wayne's album No Holding Back in 2003, "Dust Dem Slowly" and "Dead Serious" in 2004). How did you get connected ? I was hanging around MadHouse Studio at the time, Dave Kelly's apprentice engineers at the time were my school mates Della Baddeble and Cisco. They introduced me to Wayne and the chemistry just flow from there. Can you tell me more about the band Entourage ? Entourage is a group composed of Wayne, Showki Roo and me. Showki Roo is Wayne's wife Jackie little nephew. We've been singing together before 2000, we use to voice out for Renaissance Sound, we use to collaborate on Dubs before we even started recording. The first Entourage song we do was "O.U.T" a song me and Wayne wrote. When Wayne Wonder career took off, the Entourage song "Metal and Steel" was featured on his album No Holding Back. We currently have a movie soundtrack for the film Something New you can check it out on MySpace and look in my top friends. 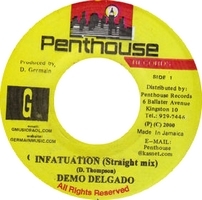 Tell us about the other singles you recorded for Penthouse. "Gal Dem Bebe" : That was a recut of one of my first records for Shines Records in 1997. Normally I don’t re-record songs, but Germain had a great riddim, the Sweetie Pie, and I thought it would fit well with "Gal Dem Bebe", so I re-recorded it with the same "Gal Dem Bebe" chorus but with new lyrics for the verses. "Infatuation" : Germain liked to come up with creative song titles that were suggestive of what the song was about. Infatuation is one of those. I recorded the song and Germain came up with the title "Infatuation". I thought it really did capture what the song was about, even though the word infatuation is no where in the lyrics. "Jack It Up" with Mr Easy : Mr Easy recorded "Jack It Up" for Germain first. Then Germain played it for me in his studio and said he wanted to include me for a new version. I got so inspired, the very next day I was back in the studio recording my lyrics. "No Love In The City" with Jahmel, Daville, Assassin and Zumjay : This was an exciting day, how could I forget it ? Collaborating on writing and recording this song with all these artists was a great experience. I think Germain came up with the idea to have all of us on the same song because we were all on his label. What stands out clearly in my mind was the energy we all put into the songwriting, and each person taking a turn to record their part as soon as it was written. "Never Stop Cry" : To be honest, I wrote this song when I was young and going through a lot of stuff with a woman. I noticed a lot of people around the world have really responded to this song. I guess it’s because they have been through some of the same things and they can relate to what I’m talking about in the song. "Nuff Nuff" : When I heard the Speak Softly riddim from Penthouse, I liked the dancehall vibe and got inspired to write the lyrics. Sometimes you have to do music like this to have a balance with the more serious, emotional, slower songs. "Last Laugh" : Same way, this song was inspired by things I went through in life - experiences with people. Everything you go through in life, including personal traumas has a way of coming up in your music. And writing a song about your experiences is a way to empower yourself. That’s something I got from working on this song. Why did you stop working together after this last single in 2001 ? At the time Wayne Wonder wanted me to come do some work, and I had to leave for that adventure. You recorded for many labels (Pot of Gold, 2 Bad, Shines...). What is Donovan Germain's singularity comparing to other producers ? Donovan Germain has a clearer picture of "How to market an Artist", lyrics often times have to be clean. Germain is one of the most prominent producer in Jamaica, and a reason for that is because he doesn't ''hussle'' the business, he looks at the longer term. I can remember something Germain told me, he said : "Demo, don't write songs just for Jamaica, write songs about issues that relates to the world". So Germain to me tries to develop artist so we can sometimes represent without the usage of profanity and the "hassling with Babylon". Everybody else is in it mainly for the money. 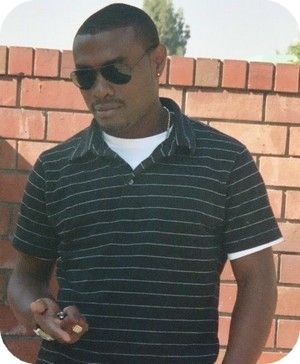 When you recorded for Penthouse, Lenky was producing most of Penthouse songs. How did Donovan and Lenky share work ? Do you earn a living with music or you have another job ? To conclude, what are your plans ? I've heard your 1st album is due to be out soon.